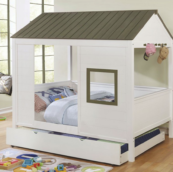 Help your kid’s imagination flourish all day long with a delightful play bed right in his room! 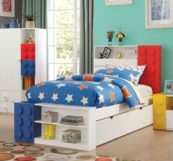 Kids Only Furniture offers Maxtrix brand beds throughout the Los Angeles area. So every SoCal kid can have a little more fun everyday with fun beds Los Angeles. What is a play bed, exactly? These beds are built for sleep and for playtime. That’s why it develops your child’s imagination. Princesses can ride into dreamland in their very own royal carriages. Likewise, future firefighters can slide into action on their very own slide. Little adventurers everywhere can camp out in the tent below their loft beds. Buying fun beds Los Angeles makes all this happen for your child. Kids Only Furniture carries beds from the most trusted brands such as Maxtrix beds, Campground and much more. All our fun beds for kids are made of solid, sturdy wood. Furthermore, all our fun beds are made without any harmful paints or finishes. Fun beds Los Angeles is what we do. Fun beds for kids is what we are about. A child’s bedroom should be a place where his or her imagination can flourish. That’s why with a theme bed from Kids Only Furniture, you can be sure that your kids will unleash their playful side! You can find your kid’s next play bed at one of our three stores throughout the L.A. area – Burbank, Upland, and Santa Monica. Each of our stores carry a wide variety of fun beds for kids that reflects our dedication to excellence. That’s why we urge you to choose from our extensive selection. Also if you’re looking for something special, we are happy to customize our furniture to meet your needs. Call your local store or visit us today!